The line that separates the bent from the unbent portion of the tube; more properly understood as a plane perpendicular to the plane of bend which divides the arc from the back tangent of the tube. The line of tangency is distinguished from the point of bend in that the point of bend is region of material on both sides of the line of tangency that becomes plasticized under the force of the bending process. The line of tangency is geometrical entity, whereas the point of bend is a physical region of the tube. 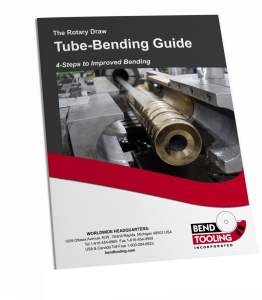 In rotary-draw tube-bending the line of tangency is fixed in space; the tubing material passes through it as it is bent. In compression bending, the line of tangency sweeps along the radius of the bend die as the pressure die presses the tubing material into the cavity of the bend die. In press bending, two lines of tangency sweep away from a central starting point as the ram die pushes the tubing material through a pair of wing dies. Therefore, the key to the superiority of the rotary-draw method of tube-bending is that a fixed line of tangency allows for the fixturing of tools both inside and outside and all around the point of bend to control the flow of material.